Wheeling Health Right hosted a kickoff breakfast for local restaurants who will participate in the clinic’s 26th annual Chefs’ Auction, set for May 3, 2019. 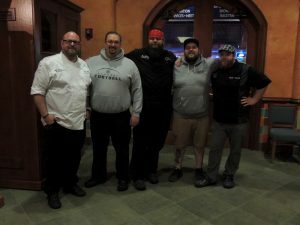 Above: Taylor from The Pointe Sea & Steak, Tom from Oglebay Resort & Conference Center, Matt from Vagabond Kitchen, Bobby from Pickles Eatery & Bar and Travis from Elmhurst, The House of Friendship. What a fun and generous group of gentlemen!